As I make my way through Roger Lewin’s book Bones of Contention: Controversies in the Search for Human Origins, I’ve become convinced of two things. First, I am embarrassed not to have read it already. 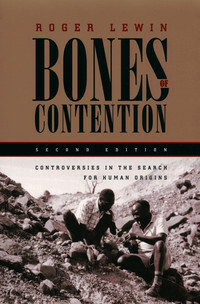 Bones of Contention is well written, filled with balanced portrayals of all the major players (with personal interviews of many), crammed with arguments and counter arguments, all the while retaining a sociological slant on the business of science. That is, the creation of new knowledge in paleoanthropology seems to have less to do with new fossils or dating techniques than personalities, group dynamics, and intellectual preconceptions. Fossils matter, but often yield center stage to the human actors whirling around them. Yet through all of this, the characters of this story, many of whom are still alive, are not reduced to caricatures. They remain interesting, passionate, even sympathetic figures. I wonder why it isn’t featured in more history of modern science courses? It’s now on my list. This sounds somewhat similar to Robert Peary’s expeditions to the Arctic, highly organized, tightly run affairs that offered a lot of experience to other members. At the same time, most of the members of the expedition who had aspirations to lead their own expeditions (or to capitalize on the expedition with the press) ended up running afoul of Peary who rigidly controlled what members said and wrote about his treks into the Arctic. So in the end, it makes me wonder about models of exploration. Which of them are best suited for doing science, at least science as we currently conceive of it? In the cases of Peary and Leakey, their private field expeditions depended heavily on private funding and their personal appeal as celebrities. Richard Leakey had a deeper commitment to scientific knowledge than Robert Peary, but in both cases, their approach to exploring, so well suited for travel, survival, and promotion made them less well suited for the professional give-and-take needed for scientific work.